Waconia’s J. 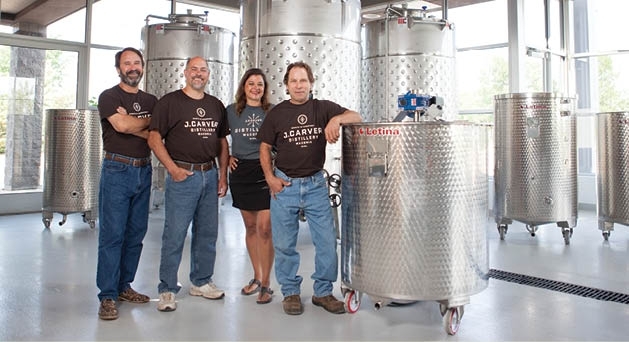 Carver Distillery is at the front of Minnesota’s micro-distillery boom. Bill Miller, Dan Niesen, Gina Holman, and Matt Miller of J. Carver Distillery in Waconia. It took some imagination to look at an old Pontiac dealership and see a liquor distillery, but thankfully the group behind Waconia’s new J. Carver Distillery is not lacking in creative thought. The idea for the distillery, which will open its doors in 2014 (visit jcarverdistillery.com for updates), was born when Bill Miller saw the growth of the craft spirit movement firsthand through his brother, Matt Miller, who ran a distillery in upstate New York, making vodka, gin, brandy and whiskey. This past spring, a cupola was added to the former car dealership to accommodate the large stills needed for making vodka. Over the summer, the group remodeled the interior of the building to create a tasting room/cocktail bar, meeting space and distilling room, and Matt began perfecting the recipes for the vodka, bourbon, gin and whiskey. All of the grains used to make the spirits come from local farms within a 50-mile radius of the distillery—with the exception of rye, which comes from further up north, near the Canadian border, where growing conditions are ideal. Before any spirit is sold, it must first pass muster with all of the distillery’s partners and get approved by an advisory panel of liquor aficionados. The spirits will be distributed through liquor stores and restaurants, and eventually the distillery will be open for tours and tasting. Education about the process of making liquor, how to appreciate each spirit’s flavor and how to craft the perfect cocktail will be a huge focus at the distillery. “I think people need to explore a little bit,” Bill says.